BURLINGTON – A task force commissioned by the city of Burlington to give recommendations on the controversial Church Street mural has come up with what they feel is the only answer to the problem: Church Street should move. 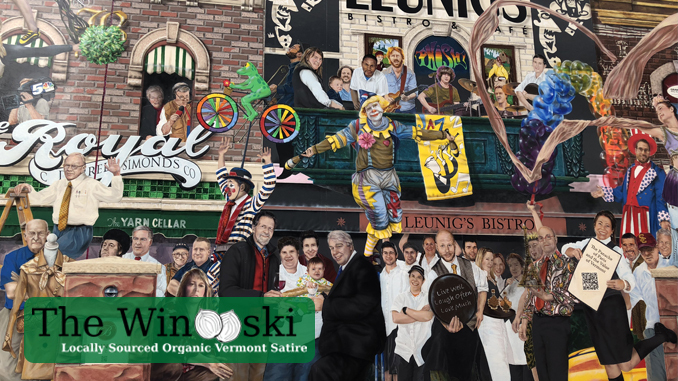 The mural, “Everybody Loves a Parade,” has been criticized for whitewashing history with its depiction of predominantly anglo-saxon-ish Vermonters, which many view as inherently racist, as Vermont has always been one of the most racially diverse states in the union with very few white people counting themselves as residents. After months of deliberation, the task force has come to the conclusion that the mural is appropriate for Church Street, but that Church Street itself is no longer appropriate for the downtown area. In its findings, the task force cited ‘increased downtown diversity, general unaffordability of life, and snootiness of marketplace aura’ as major factors in its recommendation to move Church Street to the hill section of Burlington. Burlington Mayor Miro Weinberger seemed amenable to the plan, noting that he was happy to have Church Street in the neighborhood, as long as it was not directly in his backyard. It’s about time. Maybe now I can smoke downtown–or fart at Leunig’s–without censure.